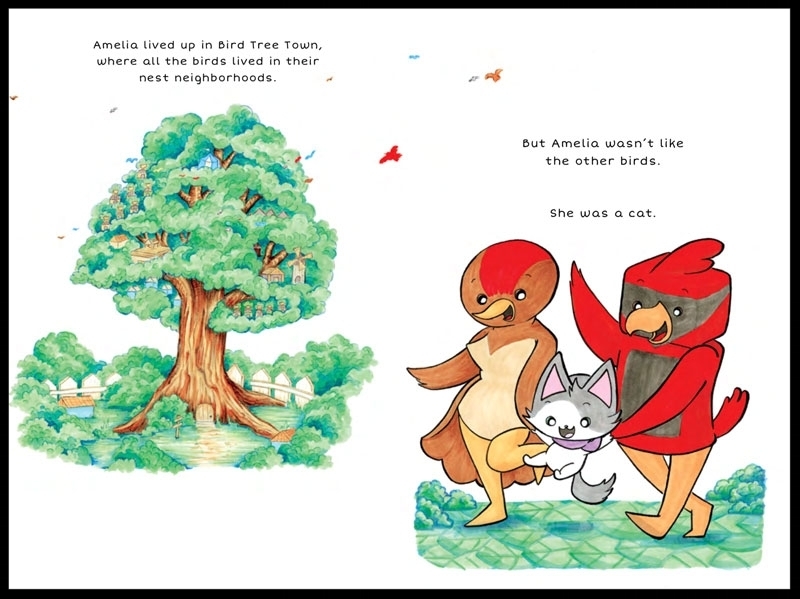 Last April, when I had finally finished writing and illustrating my first children’s book Amelia the Flying Cat, I envisioned launching a crowdfunding campaign to bring it to life. But I had an extra goal in mind too. I knew adopting families could benefit from this book. And I wanted to help those families. Surprisingly, it wasn’t that easy to find a place to donate my new children’s books to. Who knew that the usual adoption facilities were picky about donations? I called adoption agency after adoption agency. I heard “No” again and again and again. They just wanted money, not books! EVEN IF those books portrayed a heart-warming story about a cat who was adopted by birds. ...A story that showed a family loving and supporting each other, no matter how different. That is, until I called Bethany Adoption Services (now Bethany Christian Services), and Andi Swan picked up the phone. Fast-forward, after launching a successful Kickstarter (I’ll write about that story later), where EIGHTY of my backers had chosen to donate an Amelia the Flying Cat children’s book to Bethany! Wow, just… WOW. My dreams were finally coming true. And I could actually help the world as I accomplish them! So I finally walked into Bethany’s National Adoption Month “Changing Children’s Lives” Fundraising Gala this past weekend. ...Carting boxes of 80 Amelia the Flying Cat children’s books to the event. 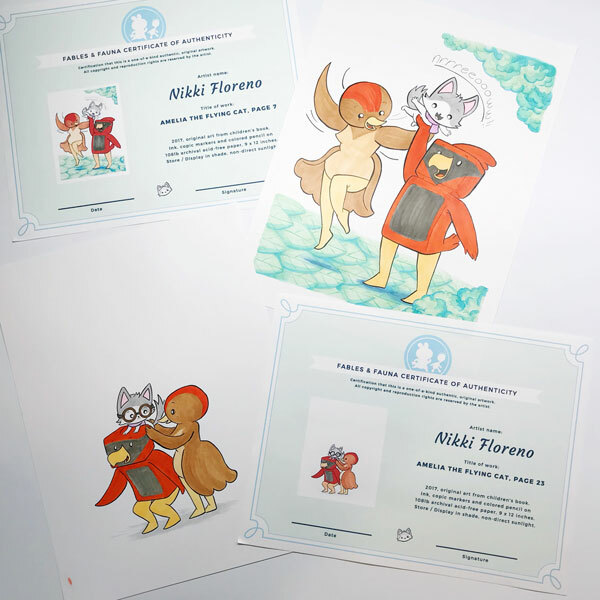 Hastily wrapping up two original works of art from the book itself, adding in their certificates of authenticity, ready to raise money during this evening’s auction. It was nerve-wracking, because I knew what was about to happen. Andi got up in front of the ritzy ballroom, made her way through her presentation slides of people to thank, until she got to one with Amelia the Flying Cat on it. And all 350+ people clapped for me. My heart sunk. They started the auction bidding. …With my original artwork from the book. EEK. “What if no one bids for it?” I thought to myself nervously. And yikes- they DIDN’T! The auctioneer called out more and more numbers. Nothing. My heart sunk even more. Apparently, starting off an auction is rough. Even for a fundraising event. Thankfully, the auctioneer got things rolling- Bid card, bid card, bid, bid, bid… SOLD! Both were sold to a crowd of people who, an hour ago, had no idea what Amelia the Flying Cat evenwas! It’s a strange feeling to walk around and hear random people tell you “Thank you,” as they walk on past. But that’s what happened for the rest of the evening, as the event drew to a close. Thank you, Kickstarter Backers for making this happen in the first place, and for those who donated a book. Thank you, Andi Swan and Bethany for letting me try to help the world, in my own way, when no one else would. Thank you, Fables & Fauna Book Club for cheering me on throughout my book-making journey. Thank you, to Amelia the Flying Cat’s editors, Emmy Scott and Douglas Humphries. 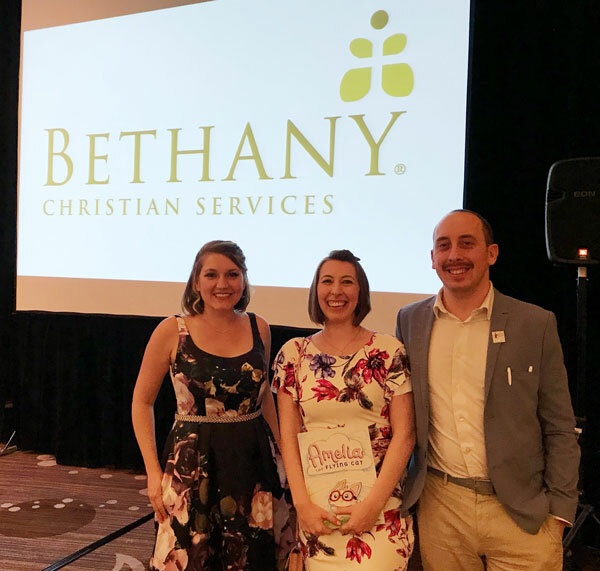 Because of ALL of us, there will now be 80 children’s books gifted to newly adopted children from Bethany Christian Services! And extra money from fundraising too, after auctioning off two Amelia the Flying Cat original artworks.